The Excel Golf GPS is one of Bushnell's latest entrants into the market, and the company makes some effort to give it a wide variety of features. The modern-looking GPS watch has 35,000 preloaded courses, Auto Course Recognition, Auto Hole Advancement, Shot Measurement, Smart Notification, Bluetooth Connectivity and many other GPS features. The Excel Golf GPS is one of Bushnell’s latest entrants into the market, and the company makes some effort to give it a wide variety of features. 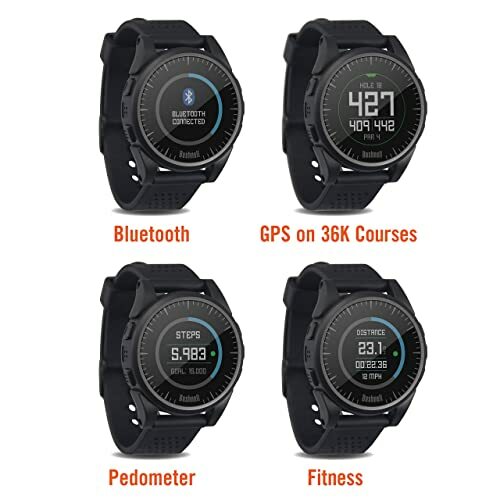 The modern-looking GPS watch has 35,000 preloaded courses, Auto Course Recognition, Auto Hole Advancement, Shot Measurement, Smart Notification, Bluetooth Connectivity and many other GPS features. It also comes with an extended battery life and golfers can use it for up to 14 hours without having to recharge it. 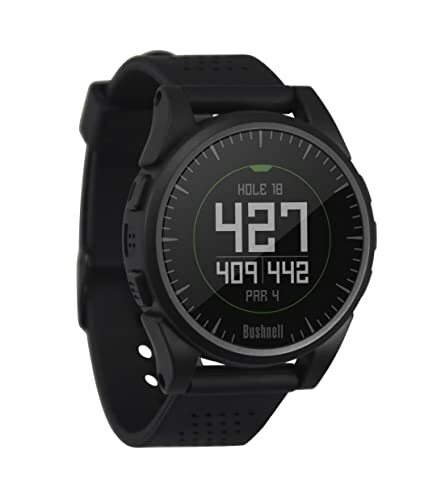 Preloaded Courses: This watch comes preloaded with more than 35,000 golf courses from 30 different countries, and it will update them via the Bluetooth wireless connection automatically. Distances: It will provide measurements that are easy to read and understand to the front, back and center of the green and up to four hazard distances for every hole. Auto Recognition/Advancement: Like most top notch golf GPS watches it features an auto course recognition feature, and it will also advance to the next hole automatically. Shot Measurement: With this watch, you can tell how far you hit with each club thanks to the shot distance calculator. Also, it has an integrated step counter that will let you know how many steps you make. Swing Pro: The Swing Pro feature makes it possible for golfers to monitor their swing speed and tempo to determine what they need to improve. Smartphone Notifications: You can get notifications for emails, messages and calendar reminders on this device directly. Battery: The long battery life is one of the things that set this device apart from similar ones. It takes only 3 hours to recharge it, and it can last for up to 14 hours or three rounds of golf. It has an impressive 14-hour battery life. The waterproof construction means you can use this watch in any weather. It is preloaded with more than 35,000 courses from 30 countries. You can use it for tournaments. This watch comes with an easy to read display. It is easy to use even for beginners. The Bluetooth integration makes it easy to sync with other devices. You can get email, text and other notifications from your smartphone. The GPS watch's price is a little on the higher end. Some golfers complain that the pedometer is not very accurate. The Excel Golf GPS from Bushnell provides golfers with the valuable technology that they need when on the course. 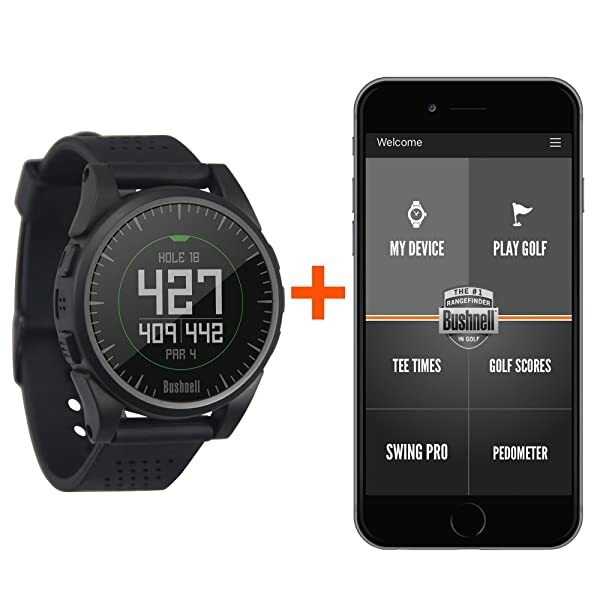 It is an easy to use golf watch that comes with more than 35,000 preloaded courses from different countries and the best thing about it is that you will never need to pay any download or subscription fees. Syncing this device with your smartphone should also not be a problem since it has Bluetooth connectivity. And if you also factor in other features like the long battery life and weatherproof construction you have a top notch golf device. But despite all the positive attributes, this is quite an expensive golf GPS, and so you should be willing to part with some extra cash. However, apart from the price, there is almost no other negative thing, and so you can be sure of a positive experience with the Excel Golf GPS.